All of us look different in one way or the other and that is how the nature works. While some are happy and content with the way they look, some are not. But confidence lies in those who accept themselves the way they are try to highlight their best features rather than cribbing about it or worse, trying to change it. Since women are extremely conscious about the way they look, they often face confidence issues when it comes to their appearance. But the essence lies in trying to highlight the best in us. There is one subtle thing in face that makes a lot of difference; it is the eyebrows. A set of well shaped eyebrows can make all the difference to the face and help you cover most of the flaws. Stepping out to parlour every time you want to get your eyebrows done can become a bit of a problem especially for all those who have a busy hectic life. Here comes a simple solution to get perfect eyebrows at the comfort of your home. This Bi-feather King eyebrow hair remover and trimmer is of great convenience to all those who find it difficult to run to parlour to get their eyebrows done. The safe and powerful blades of the trimmer give you perfectly arched eyebrows in seconds and the procedure is completely safe. 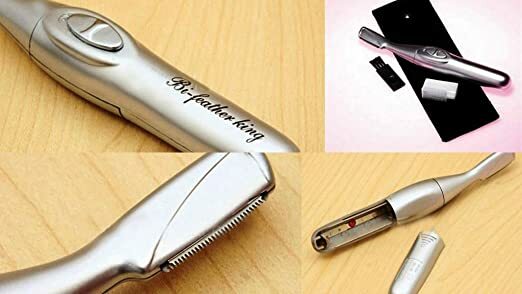 Bi-feather King eyebrow trimmer is a lightweight, portable device that runs on a strong motor and does the process using safe blades. It is portable and is small enough to be carried in your purse discreetly. You can go ahead and trim eyebrows, bikini lines, sideburns, hairline and armpits too!! This little trimmer is definitely an all in one device for your trimming requirements. The trimmer is designed to be ergonomic and comes with long handles so that you can reach areas with ease. The trimmer comes with a free carrying pouch, a cleaning brush and operates on 1 AA battery, which is not included. Check out this high utility This Bi-feather King eyebrow hair remover and trimmer on gizmodubai and get it at the best price! !